"We really felt the service we received was exceptional..."
"Response rates have increased considerably..."
During the initial decision making phase (will we/won't we replace our website?) and the subsequent planning stage we felt the guidance we received was objective, informative and very helpful. There was no "hard sell" and there was obvious understanding about the workings of a golf club. We liked that! We particularly liked the simplicity of the entire process, from the straightforward contract to the helpful checklist of information required to populate the website. The entire development phase was very smooth and was completed bang on schedule - unlike so many other projects. Whatever query or question we had was attended to immediately and we really felt the service we received was exceptional. Going live with the website went smoothly and the admin training was very well planned and expertly delivered. This, of course, was completely in character with everything else provided to us, ie no-nonsense, straightforward, practical and personal. The way the training was delivered meant it was simple and inexpensive (in time and cost) for us to set up, something important in a busy office. Also, during the period of free support we were delighted at how helpful the response was to any questions we had. It was really helpful to receive feedback about the performance of the website and all the guidance and suggestions for improving our social media presence, freely given, was invaluable (even if it may take us some time to put it all into practice). Our experience with Premium Golf Websites was emphatically 100% positive. There was nothing we could find to criticise. As someone whose training on computers ceased when I retired in 2001 I approached a new website with some trepidation. 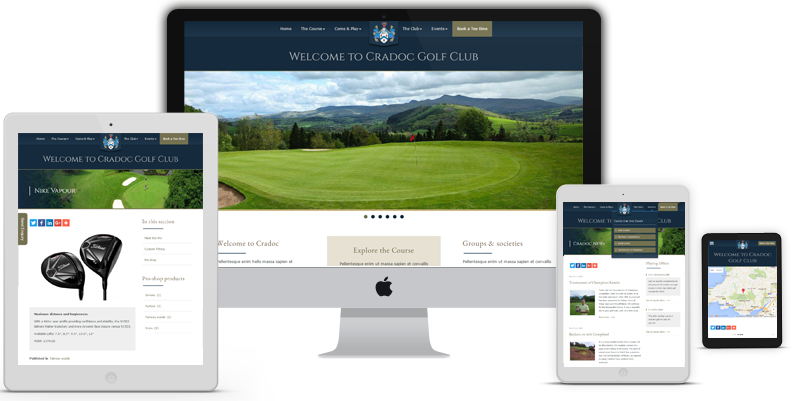 However I have to say that Andy's websites are very clear and user friendly, which has gone down very well with our members (Raglan Parc Golf Club) after many years using a "clunky" and not very user friendly website. I also found Andy's training on the use of the site and the accompanying notes extremely clear - many thanks. Response rates have increased considerably even in the 8 weeks our site has been active. Browse the three example demo websites to decide which version suits you best. Also choose which optional 'Support Package' is best for you.